“The greater the individual freedom, the faster is human progress, for free minds think of even more new things to be done than men can do in the limits of space and time.” ~Rose Wilder Lane, Woman's Day Book of American Needlework , 1963. “Rose began school in De Smet [South Dakota], and learned to read and write very quickly. In 1894, Rose embarked on her final childhood journey with her parents and their friends, the Cooleys. The two families traveled in a horse-drawn hack to the Ozarks in Missouri. Laura's diary of this trip was later edited by Rose and published as On the Way Home. Laura Ingalls Wilder once wrote that home is “the best place for teaching many things, first and most important of which is how to think for one's self” (February 5, 1920). Laura's daughter Rose was the embodiment of that sentiment, as she was very independent. She did many things differently than other women of her time – she wore trousers, short dresses, cut her hair, and spoke her mind. Rose would grow up to become a journalist, novelist, and political theorist who promoted the basic American principles of liberty, freedom, and individualism. After finishing high school in 1904, Rose studied telegraphy informally at the local railroad station, under the tutelage of the station master. Still not yet 18 years old, she took a job at Western Union in Kansas City, joining the growing ranks of “bachelor” working girls. Living on her own for the next five years, she worked as a telegrapher in Missouri, Indiana, and California. During this time she read voraciously and taught herself several languages (French, Italian, German, and Russian). On March 24, 1909, Rose married a reporter and salesman named Gillette Lane; both of them were 22 years of age and they lived in the same San Francisco apartment building. They settled for a while in Kansas City before returning to San Francisco. Between 1912 and 1914, Rose was one of the first female real estate agents in California. She and her husband sold farm land in what is now the San Jose/Silicon Valley area of northern California. They had a son who died at birth, and medical complications left Rose unable to have any children after that. Rose’s writing career began around 1910 with the occasional newspaper job to earn extra cash. There was a downturn in the real estate market due to the threat of America's entry into World War I, so in early 1915 Rose accepted a job as an editorial assistant on the staff of the San Francisco Bulletin. She immediately caught the attention of her editors not only through her own writing talents, but also as a highly skilled editor for other writers. Before long, she became a full-time feature writer with her photo and byline running in the Bulletin daily. Her articles were often picked up for syndication to other papers around the country. By 1918, Gillette had become mixed up in several financial schemes causing the couple to have legal and personal issues. They divorced, and Rose quit her job with the San Francisco Bulletin to launch a career as a freelance writer. From this time through the early 1940s, she wrote many articles and serials for leading publications such as Harper's, Saturday Evening Post, Sunset, Good Housekeeping, and Ladies' Home Journal. She also wrote many books including: Diverging Roads , Let the Hurricane Roar (re-issued as Young Pioneers ), Old Home Town, and Free Land . Several of her short stories were nominated for O. Henry awards and a few of her novels became top sellers. She published one of the first biographies of Herbert Hoover, whom she greatly admired. Rose also did ghostwriting for others. From 1920-1923, Rose worked as a publicist for the American Red Cross. In 1920 she travelled to Paris, Geneva, Vienna, Prague, and Warsaw while observing Red Cross post-war activities and writing about them. In 1921 she visited Albania, Yugoslavia, and Italy, and wrote many articles that year which were published in the Red Cross Bulletin. In 1922 Rose spent much of the year travelling across Eastern Europe through the Balkans and into the Soviet Union, just four years after the Bolsheviks led by Vladimir Lenin seized power. Rose continued her travels in 1923, visiting the Middle East before returning to Paris and then to the United States. Of all the countries she visited, Albania became her favorite place in the world. She loved the mountains, the sea, the architecture, the culture, and the way of life. She stayed there long enough to witness a revolution and receive two offers of marriage – one from King Zog, and another from the tribal chief Lulash of Thethi. Rose informally adopted a young Albanian boy named Rex Meta who had saved her life on a dangerous mountain trek; she later sponsored his education at Cambridge University in England. Rose's book, Peaks of Shala , describes her mountain trip and the 1922 revolution. Travels With Zenobia: Paris to Albania by Model T Ford describes the drive she took to Albania. Rose Wilder Lane, with her richness of description, was one of the most interesting writers of the early 20th century. Susan Wittig Albert wrote, “Rose had a remarkable memory, an even more remarkable gift for story, and a way of enlarging personal experience that made it memorable and special.” In the late 1920s, Rose Wilder Lane was reputed to be one of the highest-paid female writers in America. She counted among her friends such well-known literary figures as Sinclair Lewis, Isabel Paterson, Dorothy Thompson, Helen Boylston, Floyd Dell, Max Eastman, and Lowell Thomas. Despite this success, Rose’s compulsive generosity with her family and friends often found her strapped for cash even at the height of her career. In 1928 Rose spent $11,000 to have a retirement cottage built for her parents on the back 40 acres of the 200-acre Wilder fruit and dairy farm at Rocky Ridge. It was named “The Rock House” because of its custom rock masonry siding. The house plan, which Rose ordered from the Sears & Roebuck catalog, featured modern conveniences such as indoor plumbing, electrical wiring, and a garage (she also gave her parents a new blue Buick and taught them how to drive). Rose lived in the white farmhouse that Laura and Almanzo had originally built, which she remodeled and modernized. While there, Rose took in and educated two local orphaned brothers. When Rose was a child, she had always begged her mother for stories of her pioneer girlhood. Now that she was an accomplished writer herself, Rose encouraged Laura to write down all of her childhood memories on paper. In 1930 Laura Ingalls Wilder wrote an autobiography called Pioneer Girl. After it was turned down by publishers, Rose helped her to rewrite it as a juvenile book, and it was released as Little House in the Big Woods (1931). This was followed by three more Little House books: Little House in the Big Woods (1932), Farmer Boy (1933), Little House on the Prairie (1935), and On the Banks of Plum Creek (1937). These books were a great success, both critically and commercially, even in the midst of the Great Depression. In 1938, halfway through their collaboration on the book series, Rose moved to the east coast to be closer to her publisher. She purchased a 60-year-old home on three acres outside of Danbury, Connecticut, where she returned to her faming roots and lived a modern-day version of pioneer life just two hours from Manhattan, NY. Rose collaborated by mail with her mother on By the Shores of Silver Lake (1939), The Long Winter (1940), Little Town on the Prairie (1941), and These Happy Golden Years (1943). Rose’s rural lifestyle in Danbury became a sort of political statement. She called President Franklin Roosevelt “a dictator” and thought the strength of America was withering under government handouts. She vehemently opposed the New Deal, “creeping socialism,” Social Security, wartime rationing, and all forms of taxation. Determined to live off the grid, she resisted World War II rationing by growing and canning her own fruits and vegetables while also sharing a cow, a pig, and some chickens with her neighbors. She took up needlework, cut her expenses to the bare minimum, and kept her income as low as possible so she wouldn’t have to pay any taxes. Despite continuing requests from editors for both fiction and non-fiction material, Rose turned away from commercial writing. Rose's primary concern at this time was the infringement of individual rights by governments. A staunch opponent of communism after experiencing it first hand in the Soviet Union during her Red Cross travels, Rose tirelessly promoted the concept of individual freedom. She believed that the laws of morality are woven into the fiber of creation, providing guidance for human behavior. In 1943 she published a book titled The Discovery of Freedom: Man's Struggle Against Authority, which traces the history of freedom and its impact on society, and points to America as a leader in the revolution of freedom. As one of the 20th century’s most ardent proponents of liberty, Rose not only wrote about freedom, but took action when she felt the government was infringing on her rights. In 1943 she publicly denounced the Social Security program as a socialist Ponzi scheme (a money-making technique for which con man Charles Ponzi had gained notoriety in 1920). The FBI took notice of her “subversive activity,” leading them to investigate Rose and question her motives. In response to this infringement on her right to free speech, Rose published some newspaper articles and a pamphlet titled “What is this, the Gestapo?” reminding Americans to be watchful of their rights. As Rose saw it, there was no American political party committed to individualism. But she believed that individual liberty was the core political value of modern civilization itself. 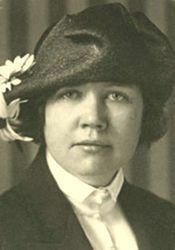 Thus, Rose Wilder Lane is considered a “founding mother” – along with Ayn Rand and Isabel Paterson – of the Libertarian party. According to Brian Doherty in his book Radicals for Capitalism, Rose was actually the first to use the term “libertarian movement” in the modern sense. Rose’s political philosophy was based on the principles of personal responsibility, limited government, minimal taxes, and no entitlements. Her book The Discovery of Freedom is considered a founding document of the American libertarian movement, as is her “Credo” essay (republished as “Give Me Liberty”) in which she compares socialism to individualism and shows how the latter is the only path that enables America to flourish. Rose became one of the most influential Libertarians of the middle 20th century, even training up a “political disciple” named Roger Lea MacBride. Roger was the son of Burt MacBride, an editor at Reader's Digest who was planning to condense one of her books for the magazine. Rose and Roger took a liking to each other and he became her “adopted grandson.” From the time he was 14 years old he came to spend weekends with her, weeding her garden and doing other chores, while she talked to him about history, economics, politics, and philosophy. Biographer William Holtz wrote that young “MacBride found himself receiving another education, an alternative to his classroom learning that was compelling by the range, focus, and energy this other grandmother brought to the political and economic arguments she had spent two decades in refining” (The Ghost in the Little House, p. 325). Rose supported Roger's efforts to establish libertarian student groups at Princeton, where he earned his undergraduate degree, and at Harvard, where he went to law school. After graduating from Harvard Law School, Roger was elected to the Vermont state legislature. He was the very first person ever to run for public office as a Libertarian when he ran for Governor of Vermont in 1966. In 1972 as a Nixon delegate, he cast an electoral vote for the Libertarian ticket of John Hospers/Toni Nathan, making Toni Nathan the very first woman in U.S. history to receive an electoral vote (12 years before Geraldine Ferraro and 37 years before Sarah Palin). MacBride is best known as the 1976 Libertarian candidate for President. Laura Ingalls Wilder had assigned 10% of the Little House royalties to Rose a few years before she died, and Rose inherited the rights to the books when her 90-year-old mother died in 1957. This inheritance put an end to Rose's self-enforced modest lifestyle; she renovated and remodeled her Connecticut home, and began to travel extensively again. She gave money to the local townsfolk who had started a non-profit corporation to purchase her mother’s Rocky Ridge Farm house and make it into a museum, and she also donated many of the family's belongings to help establish the museum which still draws thousands of visitors each year to Mansfield, Wisconsin. In 1965 Rose went on a tour of the Vietnam War zone. At 78 years of age, she was the oldest war correspondent to cover that conflict. Her article, “August in Vietnam,” providing a woman's point of view, was published by Woman’s Day magazine in December 1965. The last protégé to be taken under Rose's wing was the sister of her Vietnamese interpreter; impressed by the girl's intelligence, she brought her to the United States and sponsored her enrollment in college. Rose left her estate and the rights to the Little House books to Roger Lea MacBride. In 1973 MacBride published The First Four Years , the story of Almanzo and Laura's attempt to homestead, and Rose's birth and early childhood. The manuscript for this book, based on a diary Laura kept during her married years, was in Rose's possession and had evidently been written by her mother in the 1940's and then set aside. Since Rose never edited it as she had her mother's previously published works, The First Four Years is less polished in style and much more somber in tone than the earlier books. In the 1970s MacBride co-created and co-produced the television series Little House on the Prairie (starring Michael Landon, Melissa Gilbert, and Karen Grassle), based on Laura Ingalls Wilder’s books. He also approved the miniseries The Young Pioneers (starring Linda Purl, Roger Kern, and Robert Hays), which was based on a compilation of Rose Wilder Lane's two best-selling novels. The papers of Rose Wilder Lane were donated to the Herbert Hoover Presidential Library by Roger Lea MacBride in 1980. In the 1990s, MacBride added to the Little House body of work by writing a spinoff series called The Rose Years, a semi-fictional re-telling of Rose's life from the age of seven to nineteen. The eight novels written by Roger Lea MacBride are: Little House on Rocky Ridge (1993), Little Farm in the Ozarks (1994), Little Farm in the Ozarks (1995), On the Other Side of the Hill (1995), Little Town in the Ozarks (1996), New Dawn on Rocky Ridge (1997), On the Banks of the Bayou (1998), and Bachelor Girl (1999). You can read more about Rose’s early childhood in On the Way Home: The Diary of a Trip from South Dakota to Mansfield, Missouri, in 1894 and in several stories collected by noted Wilder historian William Anderson in Little House Sampler : “Rose Wilder Lane, by Herself,” “Memories of Grandma's House,” and “Innocence,” a darkly compelling piece based on the Wilders' time in the piney woods of the Florida Panhandle. http://www.famoushomeschoolers.net/bio_laura.html - Laura Ingalls Wilder biography. http://www.lauraingallswilderhome.com/?page_id=2 - The Laura Ingalls Wilder Historical Home and Museum has a section dedicated to the life, writings and career of Rose Wilder Lane. Recreations of rooms from Rose’s homes, her desks, her manuscripts, and souvenirs from world travels are displayed to reflect the creative and exciting life of the Wilders’ only daughter. http://www.liwfrontiergirl.com/rose.html - Rose Wilder Lane page at the "Laura Ingalls Wilder: Frontier Girl" site. http://susanalbert.typepad.com/lifescapes/rose-wilder-lane/ - Lifescapes: Rose Wilder Lane. http://www.danburymuseum.org/danburymuseum/Lane.html - Rose Wilder Lane page from the Danbury Museum & Historical Society. http://www.ecommcode2.com/hoover/research/historicalmaterials/other/lane.htm - Rose Wilder Papers: Scope and Content Note. http://web.archive.org/web/20121019224446/http://www.cato.org/special/threewomen/wilder-lane.html - Rose Wilder Lane: Celebrating Liberty in Women's History Month. http://www.fee.org/the_freeman/detail/rose-wilder-lane-isabel-paterson-and-ayn-rand-three-women-who-inspired-the-modern-libertarian-movement - “Rose Wilder Lane, Isabel Paterson, and Ayn Rand: Three Women Who Inspired the Modern Libertarian Movement,” by Jim Powell. http://www.libertarianism.org/people/rose-wilder-lane - A biography of Rose Wilder Lane at Libertarianism.org. https://mises.org/daily/4235 - “The Libertarian Legacy of Rose Wilder Lane,” by Jeff Riggenbach. http://www.legacy.com/ns/FullStory.aspx?StoryType=1&StoryID=17 - “Rose Wilder Lane: Pioneer of Liberty,” by Amy Lauters at Legacy.com. Holtz, William (May 1995). The Ghost in the Little House: A Life of Rose Wilder Lane . University of Missouri Press. Lauters, Amy Mattson (February 2007). The Rediscovered Writings of Rose Wilder Lane: Literary Journalist . University of Missouri Press. “Americans are thinking politically again, as they have not thought for eighty years, and they have not forgotten that resistance to tyranny is obedience to God.” ~Rose Lane Wilder, “Credo,” 1936.